Padre Island, a long barrier island of sand dues and sea oats stretches from Corpus Christi on the North end to the Border of Mexico on the South end. Very little development has been allowed along its precious shores. The Visitor's Center located close to the entrance has some excellent exhibits of the wildlife as found along its seashore. As depicted on the map there is little development on the mainland due to the existence of the famous King Ranch. 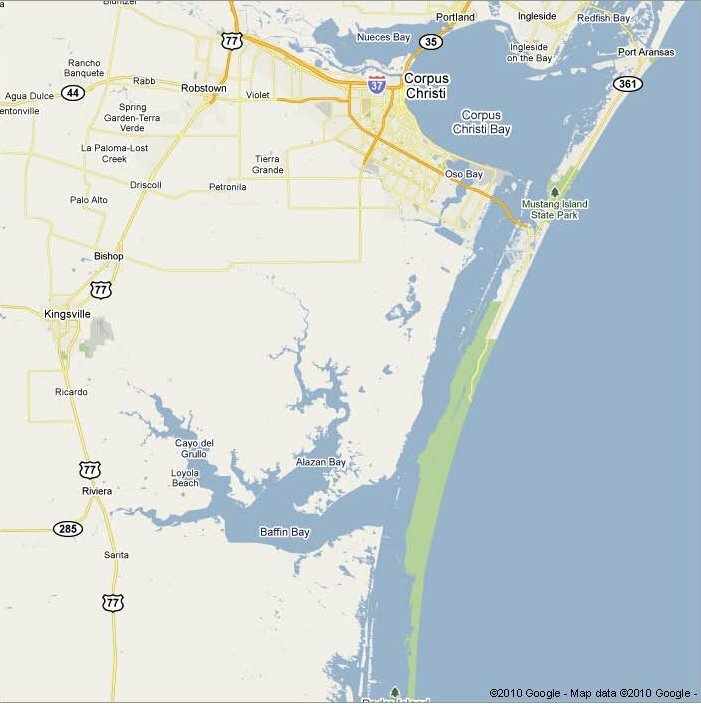 There is only one pass to the Gulf of Mexico in the 85 miles from Corpus Christi to the channel at Port Mansfield. This allows for a sense of isolation when fishing in the Lagoon. The natural undisturbed beauty is awesome. The Lagoon is mostly 3 to 4 feet deep throughout with some areas along the shoreline becoming only 1 to 2 feet deep. These vast sea grass meadows provide a nursery for marine life thus providing some of the best fishing anywhere in North America. The Lagoon is divided into two parts, the Upper Laguna Madre, extending from Corpus Christi Bay south to an area called the Land Cut. The Land Cut is 26 miles long and is basically the Intracoastal Waterway which was cut through an area of mostly dry land. The Lower Laguna Madre, the lower portion, continues south to the Border of Mexico.